Given the quickening 'half-life' of knowledge, is Jagdish Sheth's 'Rule Of Three' still as relevant today as it was when he first enunciated it? Have it straight from the Charles H. Kellstadt Professor of Marketing at the Goizueta Business School of Emory University, USA. Plus, his views on competition, and lots more. Arun Maheshwari, Managing Director and CEO of CSC India, the domestic subsidiary of the $11.3-billion Computer Sciences Corporation, wonders if India can ever become a software product powerhouse, given its lack of specific domain knowledge. The way out? Acquire foreign companies that do have it. The Future Of Indian Cities Is Here. We have seen it. And it is Bangalore. On the day in July his company declares its not-so-flattering results for the April-June quarter Wipro Ltd. Chairman Azim Premji, a patrician 57-year-old with an unruly white mane, decides he has had enough. Wipro's corporate office is in Sarjapur, a Bangalore borough that has stayed off the radar of city departments, athough a proposed it corridor linking Electronics City in the south of the city to Whitefield in the north should change that. The road to Wipro's office is bad, accidents are commonplace, and on this particular day the telephones are down-reason enough for the usually placid Premji to launch a broadside at the state government. Bangalore, a city of six million that has emerged the hub of knowledge-businesses in India, is a mess. Brown-outs are a way of life, parts of the city suffer from water shortage, and peak-time commuting is torturous, if not downright hazardous. Delhi has better roads, Mumbai, a more reliable power-supply, and Chennai has made some faltering progress towards installing a city-wide Mass Rapid Transit System (an elevated railway), a process that is stuck somewhere in the government-works in Bangalore. A few hours before Premji's offensive, Karnataka Chief Minister S.M. Krishna meets with Nandan Nilekani, the CEO of the city's best-known company, Infosys Technologies, and Chairman of the Bangalore Agenda Task Force, an entity vested with the responsibility of working with city departments to upgrade Bangalore. Also present are bureaucrats, including the Commissioner of Bangalore Development Authority, Jayakar Jerome. Jerome is a 56-year-old born-again Christian whose zeal extends into his job. When he took over, the government was mulling the closure of BDA, which had allotted all of 3,400 plots in the preceding decade. In his three-and-a-half years in office, Jerome has recovered BDA land valued at Rs 400 crore that had been encroached upon, allotted 40,000 plots, and raised Rs 100 crore through an issue of debt that was rated LAA+ by ICRA. And BDA, although it isn't required to, uses its money to build roads and overpasses. The most ambitious of such efforts is a 66-kilometre stretch that marked the completion of Bangalore's much-awaited Outer Ring Road, a road the National Highways Authority of India now wants to buy off BDA. Apart from making several enemies-he has received death threats from the local land mafia-Jerome has turned BDA into a cash-rich organisation and become the visible symbol of the Chief Minister's reformist credentials. One of the items on the agenda for this morning's meeting is the restoration of Lalbagh, a city park built in the 18th century by Hyder Ali that has since fallen into some level of disrepair. Till as recently as the 1980s, Lalbagh, with its rose garden and a glasshouse modeled after Kew Garden's Palm House, was a tourist attraction. The park covers 260 acres in Bangalore's older quarter and Krishna would like nothing better than to see it regain its lost glory. He thinks BDA is just the organisation to effect this. The catch? The park is administered by another city department that, at this meeting, offers to do whatever is required if BDA bankrolls it. Jerome is having none of that. "I am not giving one rupee of BDA's hard-earned money to anyone," he says. The Chief Minister indicates that he would like BDA to do the job; the other department falls in line. At 7.30 a.m., an hour before the Chief Minister's meeting begins, 600 volunteers-professionals, retirees, salarymen, homemakers-leave their homes and head for designated garbage collection areas to supervise the process, part of the Swachcha Bangalore programme launched by BATF and Bangalore Mahanagere Palike, the city corporation. Wipro is among the first lot of companies to declare its results for the April-June quarter, but BMP's accounts for the same period are ready too, courtesy a Fund Based Accounting System (EFF bass, or f-bas) designed by Ramesh Ramanathan, previously Managing Director and European Head, Derivatives Marketing, Citibank N.A., and now, Member, BATF and Campaign-Co-ordinator, Janaagraha, a citizen's organisation with a membership of 250,000. "We are the only municipal body in the country that declares quarterly results," says bmp Commissioner Sreenivasa Murthy. One of the city's colleges is closed this Friday. Its students, under the aegis of Janaagraha, have volunteered to map the city, inch-by-painstaking-inch-information that will be ported on to satellite maps of the city provided by the National Remote Sensing Agency to create the basis for a 10-year Comprehensive Development Plan on which Janaagraha and BDA are collaborating. Ramesh's wife Swati Ramanathan, a trained architect and urban planner, believes the CDP, apart from helping city agencies administer Bangalore better, will help citizens define and create their kind of city. Elsewhere in the city, Harish Bijoor, a former beverage and telecom exec who now runs an eponymous consulting firm, is mapping out the area he and his army of 22 volunteers will clean this weekend. Something is happening in Bangalore and the world is beginning to take note. New Delhi Municipal Corporation is working on an EFF-bas and the Comptroller and Auditor General's recent accounting guidelines for urban local bodies borrow extensively from the bmp model. BATF Member V. Ravichandar, Managing Director, Feedback Marketing Services, an industrial market research agency, is off to Tiruchirapalli, a city in Tamil Nadu, next month to brief its corporation on the Bangalore experience-a presentation he has already made to Mumbai, Pune, Nasik, Trivandrum and a few other cities. Delhi unsuccessfully tried to woo BDA's Jerome to head Delhi Development Authority. And Bombay First, a joint venture of some of Mumbai's best-known citizens and bureaucrats that was founded in 1995, has woken up to the achievements of BATF and is desperately playing catch-up-these days, the buzz in Mumbai is about a Bombay First-McKinsey report on transforming the city into a "world class" one by 2013. Disparate events such as chip major Intel's decision to invest in a large development centre in the city, rising real estate prices, and the high occupancy in the city's five-star hotels, then, may have less to do with the cycles such things seem to follow, and more to do with Bangalore's revival. Yesterday's Silicon Alley may well be India's most happening city tomorrow. If it gets there it will be because of an unique partnership of the government, the private sector, and the public, a partnership that perhaps belongs more in an evolved Scandinavian country (anyone seen their human development indices?) than in the capital of India's eighth largest state. The beginnings of Bangalore's renaissance can be traced to Hyderabad, and to a hoary eatery on Bangalore's St Mark's Road. It was late 1999. Krishna, a lawyer by training who looks more like a professor than a politician, had just been elected Chief Minister. And he was angry. Some astute jockeying by Andhra Pradesh Chief Minister Chandrababu Naidu had seen the McKinsey-promoted Indian School of Business decide to base itself in Hyderabad. "On the basis of all the recognised parameters, I thought it should have been Bangalore," he says. "So, when I took over, I wanted to send out a message that Bangalore would not remain the same; that it would regain its former glory." Around the same time, two of Krishna's close aides met at Koshy's, a Bangalore institution that has aged well-it still serves a mean vindaloo-and decided that the Chief Minister could do worse than form a committee and appoint Nandan Nilekani to head it. The committee was the Bangalore Agenda Task Force and it was one of the 13 task forces-most headed by CEOs-instituted by the Krishna Government. The other task forces presented their reports and faded out of existence. "We were very sure we weren't going to present a report," recollects Kalpana Kar, a former Tata Administrative Services Executive and Member, BATF. "The city had some 76 of them." Instead, says, Kar, the task force decided to work with the various local government bodies responsible for managing the city. Kar herself works with bmp. And BATF's resident evangelist Ravichandar works with BDA. "We weren't going to stand outside the system and badmouth it," says Ravichandar, referring to preferred activist strategy. "We were going to change it from the inside." It's no secret in Delhi's power circles that Andhra Pradesh Chief Minister Nara Chandrababu Naidu, a key ally of the BJP, usually gets what he wants. Naidu was the first Indian Chief Minister to see himself as a CEO; unfortunately, he doesn't seem to have been able to build an organisation, or effect structural and systemic reforms. Hyderabad, consequently, has suffered. Still, Naidu is trying his best to ensure that Hyderabad steals a march over Bangalore: he is lobbying the government to move to an open sky policy and make Hyderabad a transit point between Europe and China; he plans to make the planned Hyderabad international airport one of Asia's biggest and most modern; and he is already pitching Hyderabad as the pharmaceutical, biotech, and health services capital of India. All very creditable, but equally individual-driven, and very very "top-down" as one city planner puts it. The participative nature of Bangalore's renaissance could well give that city an edge. The Ramanathans were part of that change. Five years ago, they decided to return to India from London. Ramesh wanted to work in the area of urban poverty, and runs a Bangalore-based micro finance organisation Sanghamitra. Along the way he became interested in government finances. It's easy to visualise someone like Ramanathan in Citi's Type-A environment: he speaks rapidly, in short staccato sentences, and uses the language of business. "It's amazing that no government has a double-entry book keeping system," he says. And so, he put his energies to understanding best practices in government accounting. The accepted double-entry system of bookkeeping originated in Italy in the 14th century, although it wasn't until 1494 that a monk by the name of Luca Pacioli wrote about it in detail. The founding of The East India Company-it introduced the concepts of invested capital and dividends-accelerated the spread of accounting. Government accounting, in contrast, is a recent phenomenon. It was only in the early 1990s that New Zealand moved to an accrual accounting system. Other countries followed and the US Governmental Accounting Standards Board collated best practices and came up with a prescribed set of standards. In his mind, Ramanathan is very clear that accounting is at the core of all governmental reform. "Everything has to start from accounts," he says. "That is the biggest difference between the government and the private sector." Under the aegis of the Public Affairs Centre, a non-governmental organisation founded by Samuel Paul, a quiet-spoken academic who has served as Director, Indian Institute Management, Ahmedabad, Ramanathan was wrestling with implementing an EFF-bas for Tumkur, a small town in southern Karnataka-he was making no great progress-when he was inducted into BATF in early 2000. He saw his chance. With money from Nandan and Rohini Nilekani's Aadhar Trust (the couple has thus far put in around Rs 4.75 crore of its personal wealth into BATF initiatives), Ramanathan went out and hired 22 commerce graduates; bmp gave him use of a room in its HQ. All told, the team spent around 300,000 man-hours tracking the paper and money trail at bmp, devising a nomenclature for various expense heads, and assigning codes to every piece of developmental work being carried out by the corporation. The process took 14 months, but by April 2001, bmp had an EFF-bas in place. City corporations aren't the most reform-minded organisations. Still, with the inducement of some Rs 361 crore from the state government if it met some conditions-one of these required the corporation to move to a modern accounting system and the two bodies signed a memorandum of understanding to this effect in July 2001-bmp agreed to implement its F-bas. In 1999, soon after the congress government took over in Delhi, Chief Minister Sheila Dixit launched a programme branded Bhagidari targeted at increasing the involvement of resident welfare associations (RWAs) and NGOs in local governance. By including 'Commitment to Bhagidari' as a head in the appraisal of bureaucrats, Dixit managed to get the administration to heel. However, although Bhagidari boasts some success stories in solid waste management and rainwater harvesting, the scheme is not a runaway success. Says Arun Mishra, Deputy Secretary, Delhi Government, the man in charge of Bhagidari, "Right now, we are not focusing on results, but on sensitising the populace." For how long? F-bas isn't the only thing of note in the Bangalore of the future, but it is representative of the city's approach-scientific, scalable, and result-oriented. Similar initiatives abound. There's the Self Assessment Scheme (SAS) for property tax that has doubled receipts to around Rs 200 crore in a mere four years. There's the Nirmala programme (funded by Infosys co-founder N.R. Narayana Murthy's wife Sudha Murthy who wrote a cheque of Rs 8 crore) that has built 23 public toilets across the city; 100 more are in the offing. There's the Police Department's unique Central Area Traffic Plan, built around a clutch of one-way-only roads, and designed with the assistance of urban planners W.S. Atkins. And companies-Biocon, Bharti, Infosys, Aditi-have been in the thick of the action, offering money and expertise. "There's no question that you need (radical) tools and systems for better governance," says Nilekani. "These get amplified with (our) participation." And without these, he adds, one cannot expect the system to operate the way Infosys does. K. Jairaj isn't your everyday bureaucrat. The Principal Secretary to the Chief Minister has studied law, economics and public policy at the Universities of Delhi and Bangalore in India, and at Harvard and Princeton. He has also served as the President of the All India Management Association, the only bureaucrat to have done so ever. So, when Jairaj stops three-quarters of the way through a complex sentence involving What Really Works, an article by Nitin Nohria in a recent issue of Harvard Business Review, Infosys Chairman N.R. Narayana Murthy's oft-quoted gem about "excellence in execution", and his own belief of how there is no difference between the public and private domains, and launches into some fulsome praise of Krishna, it is hard to attribute that to sycophancy. Bangalore's love for its present Chief Minister probably has its roots in Karnataka's misfortune of being administered by some of the country's worst politicians for the preceding decade and a half. In a country where 70 per cent of the population lives in rural areas, it is suicidal for a politician to be seen to be addressing urban issues. Krishna's critics like to point out that the Chief Minister doesn't seem to be worried about parts of the state other than Bangalore. "I can't create a parallel Bangalore (in some other part of the state)," snaps the Chief Minister. "There are well-laid roads leading to all towns; all villages have access to potable drinking water; and we have made tremendous progress in the areas of health and housing." He pauses for a minute and probably realises that he hasn't been harsh enough on his detractors. "People who say this," he says, carefully choosing his words, "have not stepped out of Bangalore." Still, with elections due in November 2004, the government is taking the Bangalore-model of development to 30 cities and towns across Karnataka. Being a Congress Chief Minister in a country governed by the BJP-led National Democratic Alliance isn't easy. Krishna has, time and again, pulled out numbers to show how Andhra Pradesh, governed by the Telugu Desam Party, a BJP-ally, has benefited from the centre's munificence. Then there's the muddle of party politics. Early this year, when a member of Krishna's Cabinet made some unflattering observations about Congress President Sonia Gandhi, Bangalore (well, part of it) feared that the CM's head would roll along with the minister's. Krishna himself promises to "redouble the pace of reforms," because they "have a direct bearing on quality of life", but Bangalore needn't worry. It has systems such as EFF-bas in place and because these can always been contravened, it has that something else, a secret weapon (weapons, actually) of sorts that has the potential to keep things ticking, Krishna or no Krishna, Congress or no Congress. In 1995, some of Mumbai's corporate community, including Keshub Mahindra, Chairman, Mahindra & Mahindra, Deepak Parekh, Chairman, HDFC Ltd, and S.M. Datta, Chairman, Castrol India Ltd, came together to help reinvent Mumbai. Along with some government officials, they formed an organisation called Bombay First. Today, eight years later, Bombay First is waiting for the final results of a McKinsey study on transforming Mumbai into "a world class metro" by 2013. The firm's recommendations are expected to show how the city's Gross City Domestic Produce can grow at between 8 per cent and 10 per cent. "We are looking at finance, entertainment, and retail as some of the key drivers for growth," says Bombay First CEO S.S. Bhandare. "This is potentially a world class city," agrees an investment banker. "Whatever I have heard about the McKinsey plan sounds good; they talk a lot about mass transport and affordable housing." There's no denying that housing and transport are Mumbai's biggest challenges, but Bhandare and the banker are among the minority that thinks the report will make a difference. "Let's face it, the malaise is a political one," says Gerson DaCunha, the first CEO of Bombay First. "We have always been saddled with criminal administrators with narrow self-interests." Darryl D'Monte, a journalist and environmentalist who is involved in Bombay First, has the last word. When asked whether he can name a single effort involving citizens, the government, and corporates, his response is a crisp, "no". That's one reason Bangalore, more than Mumbai, is better placed to be India's city of the future. In February, this year, Srikanth Nadhamuni, formerly part of Sun Microsystem's Ultra Sparc development team and Jim Clark's start-up Healtheon/Web MD, attended his first BATF Summit, a large gathering of citizens, NGOs from Bangalore and other parts of India, BATF members, the city's departments, and representatives from other states. "I was blown away," says Nadhamuni. "Bureaucrats were actually presenting six-monthly report cards." Even without the summit, Cityhall is unlikely to return to the Dark Ages. In mid-2001, armed with the knowledge that BMP's f-bas could provide details on the exact amount of money that was earmarked for ward works in the corporation's budget, Ramanathan suggested that citizens participate in the process of deciding how this money was spent. The corporation shot his proposal down. Frustrated, he founded Janaagraha a citizen's movement. "For citizens to think that enlightened political leadership is all it takes for good governance is unrealistic and selfish," explains Ramanathan. So, across the city's 100 wards, Janaagrahis, as the movement's volunteers call themselves, wrote to their local corporators suggesting how the money earmarked for ward works in their area could be best utilised; in 22 of the wards, their recommendations were adopted. Ramanathan is thrilled with the results. He sees this as the beginning of a move from "representative democracy to participative democracy". That's a trend that will be difficult to reverse. India's economic progress, patchy as it may be, has brought with it a growing awareness of citizens' rights across the country. Today, eight states, including Karnataka, have passed a Right to Information Bill. So, in July 2002, Janaagraha, PAC, Voices, a Bangalore-based development communications organisation, and the Centre for Budget and Policy Studies, a research body working in the area of sustainable and equitable development, launched proof (Public Record Of Operations and Finance), a right-to-information campaign that aims to define the reporting standards for government performance. Apart from providing citizens with a framework to assess the performance of their government, this will help NGOs working from within the system-a preferred Bangalore model-to assess theirs. For instance, Akshara Foundation, a Bangalore-based NGO that has signed an MoU with the government to help with educational initiatives across 1,300 schools (it is headed by Rohini Nilekani) will use proof's framework of performance indicators to assess its impact. By design or providence, the pieces have come together for Bangalore. Systemic interventions such as f-bas have made information available, where none was before. Campaigns like proof will, over time, make it mandatory for government bodies to report their performance in the lexicon of business. And Janaagraha is, as Ramanathan terms it, "an endgame", an apt "demand side" response to "supply-side reform". In 1954, American psychologist Abraham Maslow defined his hierarchy of needs theory as explanation for what motivates people. Three decades after his death, Maslow's pyramid is still relevant-although newer theories have taken some sheen off it. At the base of the pyramid are lower order needs such as food, clothing and shelter. At the apex of his heirarchy is what Maslow termed self-actualisation, a term so nebulous that he felt the need to redefine it in 1968. Put simply, a self-actualised individual has become all that he or she had the potential to be, and consequently, looks for causes to champion that are outside one's own selfish frame of interest. Harish Bijoor believes Bangalore is where it is today because its citizens, at least those involved in city-improvement initiatives, are self-actualised. Bijoor has something there: Ravichandar, Ramanathan, Nadhamuni, Kar, Nilekani, and others at the vanguard of Bangalore's renaissance have been there, done that; money, power, and recognition don't really matter to them anymore. "If you were to look at it in terms of proportions," says Public Affairs Centre's Paul, "Bangalore has more professionals than any other Indian city", proffering his own explanation for the city's renaissance. Raghavan Srinivasan, Executive Director of market research agency TNS Mode-it conducts reviews of citizen concerns for BATF-argues that Bangalore has always been a city of NGOs thanks to its R&D, defence and public sector heritage ("Post retirement several people from these backgrounds started NGOs or signed on with them") and that its private industry is largely knowledge-oriented and, ergo, "has no baggage and believes it can make a difference." And Kar insists that timing-BATF was founded at the cusp of an era of hope; the software boom was on; and the dotcom bust was yet to happen-helped. Add things like political will and what Krishna calls "bureaucratic guts" and you get a mixture that pretty much cannot be replicated. What can be are the processes that, says Nilekani, can be "packaged, productised, and replicated". "We're using the software model for governance," he gloats. "The f-bas kit, the complete documentation on toilets-everything is open source, free-ware." Nadhamuni, Managing Trustee, eGovernments Foundation, is the man in charge of this effort. Nadhamuni and his wife Sunita moved back to India a few months ago after 16 years in the US. They had funded NGOs back home for 12 of those years and hoped to immerse themselves in developmental work on their return. The BATF Summit and awareness of what was happening in Bangalore convinced Nadhamuni that "this is the place to get plugged in". Wiring up individual processes, such as BMP's Self Assesment Service for the collection of property tax, even a F-bas is not so difficult. Nadhamuni's Holy Grail is a technology for e-governance that can be replicated across a fairly large geography, facilitates distributed decision-making and widespread access, and is web-enabled. He believes a Geographical Information System (GIS) is the answer and is currently working on a pilot project to map Byatrayanapura, a borough that falls within the purview of the larger City Municipal Corporation. "I am creating a virtual team of volunteers to do this," he laughs. "There is so much work and they can do it from anywhere in the world; do you think you could mention our website, www.egovernments.org ?" TNS Mode's surveys (see Progress Has Been Made...) definitely indicate an improvement in quality-of-life parameters. "In a growing city like Bangalore, you have to run to stay where you are," says the agency's Raghavan. "So, a small improvement is actually a big deal." Industry sure thinks so. Ketan Sampat, President of Intel India announced last month that the company is investing an additional $41 million (Rs 188.6 crore) in building a new 43-acre campus in Bangalore. 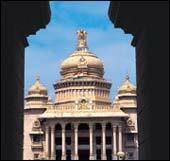 Intel is believed to have picked Bangalore after examining six other Indian cities. And two days after Premji's tirade, Krishna instituted a task force headed by the chief secretary to look into his grievances. Bangalore still has ways to go before it becomes a Singapore in India. Given the gravity of some of its problems, it may take quite some time for that to come to pass, and there's a good chance that it never will. "As long as I am headed even North by Northwest I am willing to plug on," says Ravichandar. The future of Indian cities is here. Bangalore is it.